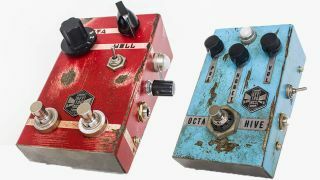 There's been a lot of buzz (cough) surrounding Beetronics FX, and the LA-based company has just released its first pair of pedals: the ridiculously cool-looking WhoctaHell and OctaHive. Both pedals offer handmade, relic'd enclosures and gnarly octave fuzz tones, but the WhoctaHell focuses on low octaves, while the OctaHive offers Octavia-style octave-up. Two knobs for Whocta (fuzz volume) and Hell (octave volume) adjust the WhoctaHell's gain and square-wave low-octave; there's also a side-mounted master volume control, and an octave selector switch toggles between one and two octaves down. The octave signal can be switched on and off by a separate footswitch, too. The OctaHive's onboard controls include Pre (input volume before the circuit), Honey (gain) and a master volume. A side-mounted toggle switches the octave in or out. Standard 9V power supply operation and true bypass switching are onboard, but Beetronics offers standard and custom series models of each pedal; both versions are handmade and feature the same circuits, but the custom series offers one-off finishes, as well as custom colours and parts. The attention to detail even continues to the custom PCBees (sorry), all of which adds up to two of the most stunning pedals we've ever laid eyes on. The WhoctaHell and OctaHive are available now from Beetronics for $230 (standard series) and $280 (custom series) - provided they haven't already sold out, of course.